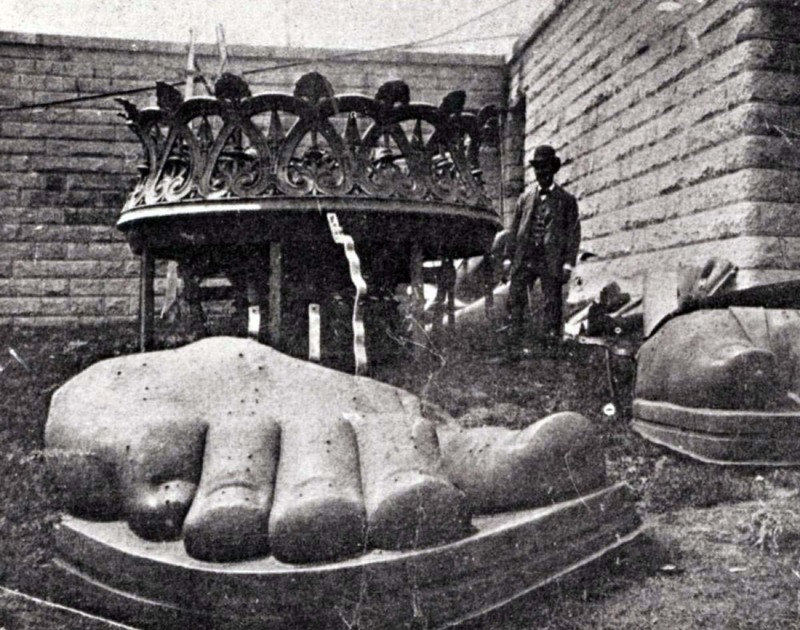 Unpacking of the head of the Statue of Liberty, which was delivered on June 17, 1885. The Statue of Liberty was completed in Paris in June 1884, presented to America by the people of France on July 4, 1884. The copper statue is of a robed female figure representing Libertas, the Roman goddess, who bears a torch and a tabula ansata (a tablet evoking the law) upon which is inscribed the date of the American Declaration of Independence, July 4, 1776. Designed by Frédéric Auguste Bartholdi and built by Gustave Eiffel, the statue was dismantled and shipped to US in early 1885. The finished statue consisted of 350 individual pieces shipped to the US in 214 crates. On June 17, 1885, the French steamer Isère, laden with the Statue of Liberty, reached the New York port safely. New Yorkers displayed their new-found enthusiasm for the statue, as the French vessel arrived with the crates holding the disassembled statue on board. Two hundred thousand people lined the docks and hundreds of boats put to sea to welcome the Isère. After five months of daily calls to donate to the statue fund, on August 11, 1885, the World announced that $102,000 had been raised from 120,000 donors, and that 80 percent of the total had been received in sums of less than one dollar. 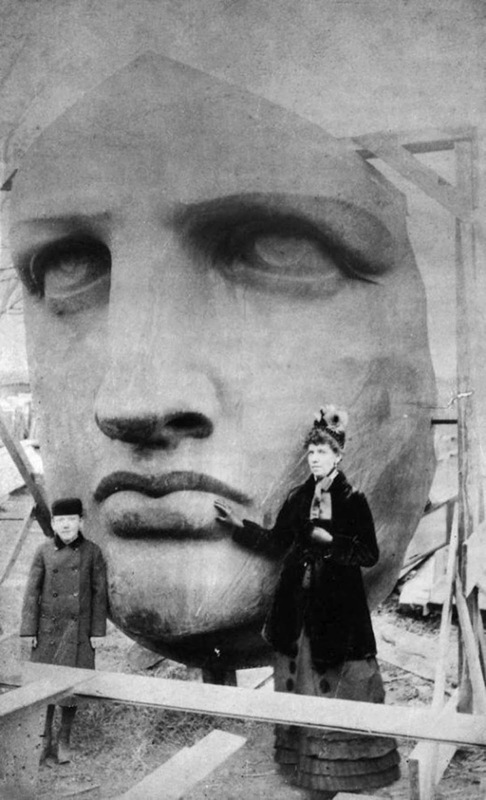 Even before Lady Liberty became an American symbol of freedom, pieces of the statue were popular tourist attractions in their own right as people flocked to see the work under construction. Even with the success of the fund drive, the pedestal was not completed until April 1886. Immediately thereafter, reassembly of the statue began. Eiffel’s iron framework was anchored to steel I-beams within the concrete pedestal and assembled. Once this was done, the sections of skin were carefully attached. Due to the width of the pedestal, it was not possible to erect scaffolding, and workers dangled from ropes while installing the skin sections. Nevertheless, no one died during the construction. Bartholdi had planned to put floodlights on the torch’s balcony to illuminate it; a week before the dedication, the Army Corps of Engineers vetoed the proposal, fearing that ships’ pilots passing the statue would be blinded. Instead, Bartholdi cut portholes in the torch—which was covered with gold leaf—and placed the lights inside them. A power plant was installed on the island to light the torch and for other electrical needs. 179,200 pounds (81,300 kilograms) of copper was used in Statue. 250,000 pounds (113,400 kilograms) of iron. Total weight of the Statue is 450,000 pounds (225 tons). The thickness of Copper sheeting is 3/32 inch (2.37 mm), about the thickness of a penny. 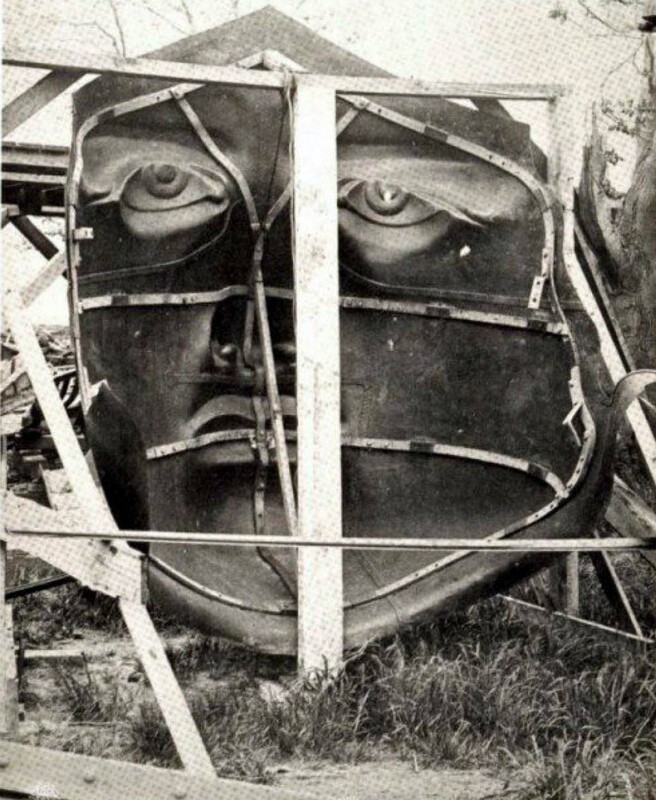 Before Lady Liberty was standing tall, she had to be assembled piece by piece. Tourists take a peek at Lady Liberty’s massive foot as she is built in Paris before embarking on her long journey to the United States. 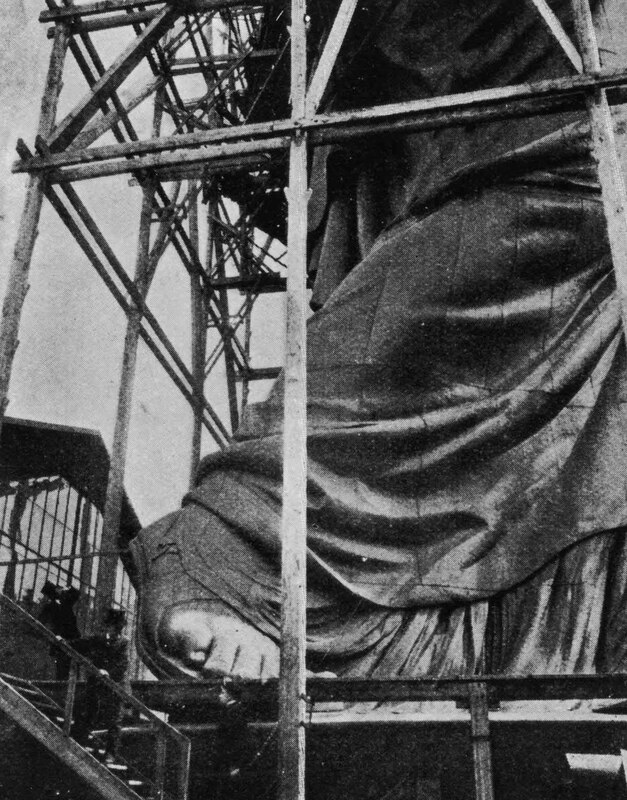 The Statue of Liberty’s limbs and crown arrived piecemeal before they were constructed together into Lady Liberty. 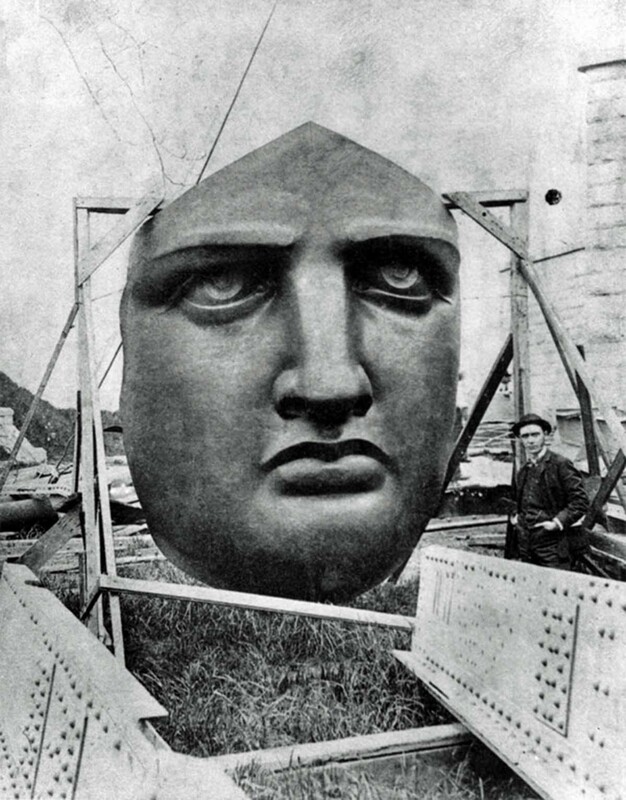 They’re seen being uncrated here on Liberty Island in 1885. I don't think that's the crown in the last photo; it looks like part of the torch. Awesome pictures. The first one reminds me of Marty and Doc in Back to the Future having their picture taken in front of the courthouse clock. That was also in 1885. Makes me wonder if the directors got the idea from this picture.